You remember to cut your own fingernails and toenails, but when was the last time you did the same for your dog? For some owners, this is an intimidating task. Toenails that grow too long, however, can make it difficult or painful for your dog to walk. They can also break and bleed. How do you know when it’s time to cut your dog’s nails? A large breed dog should have its toenails trimmed when they are long enough to scratch against the ground. Purchase a trimmer that is intended for large dogs. Trimmers that are made for small breeds will not be strong enough to cut through a large dog’s toenails. Choose a guillotine style trimmer or scissor-style trimmers. Both are effective, so use whichever you are most comfortable with. Reward your dog with treats while you play with its paws. Some dogs don’t mind having their feet touched, but some large breeds are sensitive to this. Desensitize your dog by touching its paws often. Turn this into a positive experience by praising and rewarding your dog. Check the color of your dog’s toenails. Some large dogs have black toenails and others have white. If your dog has white toenails, you will notice a pink or dark spot inside the nail, just above the curve. This spot is called the “quick.” It is a bundle of nerves that will hurt and bleed if cut, so use it to measure how much nail you need to trim. Grasp your large dog’s paw firmly in your hand and use the other to position the trimmer on the nail. Ask a friend or family member to help if your large dog struggles and you can’t keep it still. Cut the nail just below the quick. For black nails, trim a little at a time until you see a circle appear on the trimmings. This means you are nearing the quick and it is time to stop. Cut just a few nails at a time if your dog is struggling. 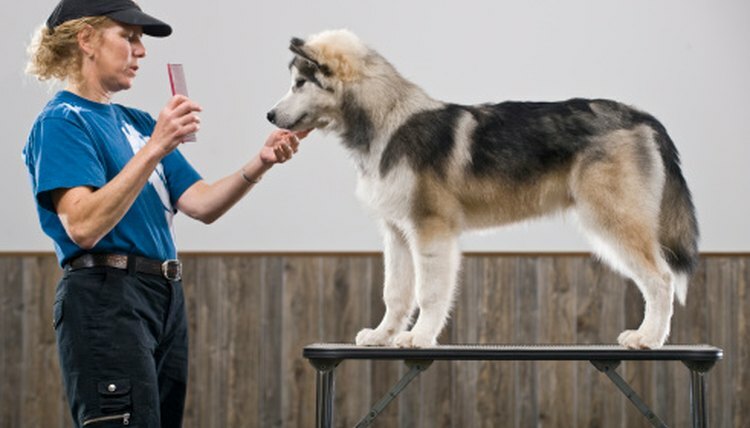 Prepare your dog for the next trimming session by giving it treats and praise as you clip its nails. This will help it to learn that nail trimming doesn’t have to be a frightening experience. Press styptic powder into any toenail that is bleeding. This powder will slow the bleeding, which should stop in after a few minutes. Look for styptic powder at your local pet store.